Black Koi Matter. Join the Karasu movement. Ask a koi keeper how they first became introduced to koi fish and they will likely recall a story of how they came across a pond, so long ago, that contained these delightfully colorful and friendly fish. Many koi keepers are drawn into the keeping of koi because of the beautiful clean bright colors of red, white, orange, and yellow. These colors are so pure, so attractive, so positively eye-catching. 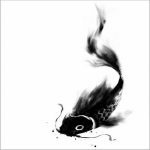 Not many koi keepers will recall being drawn to the black of the koi, the sumi. The appreciation of black, the appreciation of sumi, typically comes after keeping koi for some time. That subtle allure, that appreciation of black ends up becoming a major factor in high quality koi choices. Indeed, black koi matter. How Do I De-Ice My Koi Pond? 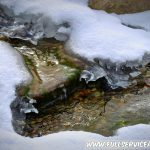 By: Mike Gannon | Posted On: January 4th, 2018 | 3 Comments on How Do I De-Ice My Koi Pond?